In 2005, the 186,000 square foot Collections Resource Center was opened as a new facility for the storage of the Museum’s vast collections. This new state-of-the-art facility was built on site, located below ground level and just south of the Museum’s historic building. It united many of the Museum’s diverse collections in a single place to provide extra space for larger anthropological and geological items and spark-proof storage for our many zoological specimens that are stored in alcohol. The facility also provided vast new wet lab space, cryogenic storage for botanical and zoological DNA and tissue samples, and dedicated x-ray and histology labs. The Field Museum houses a collection of more than 30 million specimens and objects. Through our extensive research program, this number continues to grow by roughly 200,000 specimens and objects per year. While the Museum’s historic building has over one million square feet of floor space, collections storage space has historically been a problem. This situation presented an enormous challenge in terms of lack of space, overflow, and less than ideal storage situations. 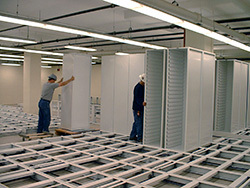 In 2001, construction began on the solution to this storage predicament: the Collections Resource Center. The Museum officially opened the doors on the 65 million dollar CRC and East Entrance project on September 12, 2005. That date also marked the beginning of our gargantuan effort to move many of the Museum collections from disparate locations across the historic building to the new facility. The CRC now houses more than 11 million specimens and objects from our anthropological, geological, paleontological, and zoological collections, as well as nearly 200,000 cryogenically frozen DNA and tissue samples that run the gamut of our zoological holdings. Amazingly, the CRC now houses more than a third of the Museum’s vast collections in an ideal, climate-controlled environment that will allow for continued expansion and collection innovation in the 21st century. 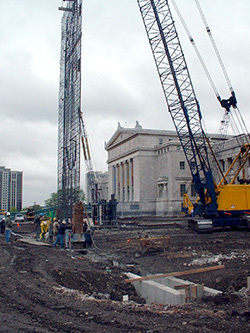 One of the driving forces of the CRC project was to keep the scientific collections of the Museum on site. In an effort to keep costs down or optimize campus space, a number of our peer institutions have chosen to build new collection space many miles away from the main research and public site. We chose to build our expansion space on site and underground to maximize scientific and public exposure to the Museum’s ethnographic and scientific collections. Geographically separating the collections from the public and researchers reduces the chances of spark or “eureka” moments where, on a whim, a scientist can quickly check for some ground-breaking anatomical finding in a gecko’s toe pad to a researcher giving a tour that inspires a child to become a biological anthropologist. In addition, many Museum visitors do not realize that these collections are used not only by our own staff of nearly 100 scientists, but the collections are visited and/or used by thousands of scientists worldwide every year. It is critical to keep the collections close, so that our curatorial and professional staff can continue to work with the collection every day and interact with the worldwide network of visiting scientists. Further, the on-site location ensures that the diversity of behind-the-scenes tours, Members' Nights, and other special events can have access to both the public exhibits as well as our extensive, carefully preserved Anthropology, Botany, Geology, and Zoology collections.